Four stars in the night sky have been formally recognised by their Australian Aboriginal names. The names include three from the Wardaman people of the Northern Territory and one from the Boorong people of western Victoria. The Wardaman star names are Larawag, Wurren and Ginan in the Western constellations Scorpius, Phoenix and Crux (the Southern Cross). The Boorong star name is Unurgunite in Canis Majoris (the Great Dog). They are among 86 new star names drawn from Chinese, Coptic, Hindu, Mayan, Polynesian, South African and Aboriginal Australian cultures. These names represent a step forward by the International Astronomical Union (IAU) – the global network of the world’s roughly 12,000 professional astronomers – in recognising the importance of traditional language and Indigenous starlore. The IAU recognised that the lack of official star names was a problem. So the Working Group on Star Names (WGSN) was formed in 2016 to officially assign popular names to the hundreds of stars visible in the night sky. That year the working group officiated 313 star names, derived mainly from the most commonly used Arabic, Roman and Greek names in astronomy. But the list contained few Indigenous or non-Western names. That changed in 2016 when the WGSN formally approved the 86 new star names drawn from other cultures. Aboriginal Australian cultures stretch back at least 65,000 years, representing the most ancient star names on the list. The WGSN is looking to identify even more star names from Australia and other Indigenous cultures around the world. As Indigenous cultures have a rich collection of names for even the faintest stars, many new star names could gain IAU recognition. The Wardaman people live 145km southwest of Katherine in the Northern Territory. Wardaman star names come from Senior Elder Bill Yidumduma Harney, a well known artist, author and musician. He worked with Dr Hugh Cairns to publish some of his traditional star knowledge in the books Dark Sparklers (2003) and Four Circles (2015). These books remain the most detailed records of the astronomical knowledge of any Aboriginal group in Australia. The stars of the Western constellation Scorpius feature prominently in Wardaman traditions, which inform the procedures of initiation ceremonies. Merrerrebena is the wife of the Sky Boss, Nardi. She mandates ceremonial law, which is embodied in the red star Antares (Alpha Scorpii). Each star in the body of Scorpius represents a different person involved in the ceremony. Larawag is the signal watcher, noting when only legitimate participants are present and in view of the ceremony. He gives the “All clear” signal, allowing the secret part of the ceremony to continue. Epsilon Scorpii is an orange giant star, lying 63.7 light years away. Wurren means “child” in Wardaman. In this context it refers to the “Little Fish”, a child of Dungdung – the life-creating Frog Lady. Wurren gives water to Gawalyan, the echidna (the star Achernar), which they direct Earthly initiates to carry in small bowls. The water came from a great waterfall used to cool the people during ceremony. Just as the water at the base of the waterfall keeps people cool and rises to the sky as mist, the water in the initiates’ bowls keeps them cool and symbolically transforms into clouds that bring the wet rains of the monsoon season. These ceremonies occur in late December when the weather is hot and these stars are high in the evening sky, signalling the start of the monsoon. Zeta Phoenicis comprises two blue stars orbiting each other, 300 light years away. From our perspective, these two stars eclipse each other, changing in brightness from magnitude 3.9 to 4.4 every 1.7 days. Ginan is the fifth-brightest star in the Southern Cross. It represents a red dilly-bag filled with special songs of knowledge. Ginan was found by Mulugurnden (the crayfish), who brought the red flying foxes from the underworld to the sky. The bats flew up the track of the Milky Way and traded the spiritual song to Guyaru, the Night Owl (the star Sirius). The bats fly through the constellation Scorpius on their way to the Southern Cross, trading songs as they go. The song informs the people about initiation, which is managed by the stars in Scorpius and related to Larawag (who ensures the appropriate personnel are present for the final stages of the ceremony). The brownish-red colour of the dilly bag is represented by the colour of Epsilon Crucis, which is an orange giant that lies 228 light years away. The Boorong people of the Wergaia language group near Lake Tyrell in northwestern Victoria pride themselves on their detailed astronomical knowledge. In the 1840s, they imparted more than 40 star and planet names and their associated stories to the Englishman William Stanbridge, which he published in 1857. In Boorong astronomy, Unurgunite is an ancestral figure with two wives. The Moon is called Mityan, the quoll. Mityan fell in love with one of the wives of Unurgunite and tried to lure her away. Unurgunite discovered Mityan’s trickery and attacked him, leading to a great fight in which Mityan was defeated. The Moon has been wandering the heavens ever since, the scars of the battle still visible on his face. Unurgunite can be seen as the star Sigma Canis Majoris (the Great Dog), with the two brighter stars on either side representing his wives. One of the wives (Delta Canis Majoris) lies further away from Unurgunite and is closer to the Moon than the other wife (Epsilon Canis Majoris). This is the wife Mityan tried to lure away. On rare occasions, the Moon passes directly over the wife of his desires, symbolising his attempts to draw her away. He also passes over Unurgunite, representing their battle in the sky. But Mityan, and Moon, never passes over the other wife (with the Arabic name Adhara). Delta Canis Majoris is an orange-red supergiant that lies 1,120 light years away. The IAU is currently considering several more Aboriginal star names, mainly from the Wardaman people. More details will emerge in due course. Recently, Dr Duane Hamacher lobbied his colleagues in the IAU Working Group for Small Bodies Nomenclature about having two asteroids named after an Aboriginal elder and a Torres Strait Islander family. The Working Group agreed and approved two asteroid names. 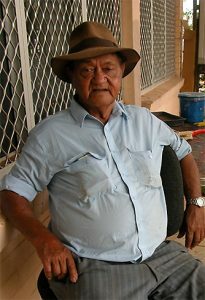 The first asteroid will be named “Yidumduma” after Senior Wardaman elder Bill Yidumduma Harney. Uncle Yidumduma is a trove of knowledge about traditional Waradaman culture, particularly related tot he stars. He co-auhtored two books on Wardaman astronomy with Dr Hugh Cairns: “Dark Sparklers” (2004) and “Four Circles” (2014) . The name is in honour of his deep knowledge and recognises his strong desire to share his star knowledge with the public. Uncle Bill approved the name. Details of the name and the asteroid itself will come in due course. The second asteroid will be named “Pasi“. 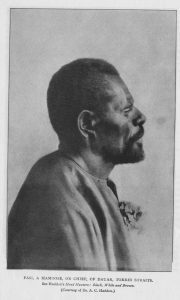 The Pasi (Passi) family is originally from the island of Dauar in the eastern Torres Strait. Members of the Pasi family hold an important place on the island of Mer and were some of the main people to teach A.C. Haddon and members of the Cambridge Expedition about their traditions. It is unfortunate that much of this knowledge was used against them throughout colonisation, and it is important to celebrate the legacy of the Passi family then and now. The family are currently sharing much of their traditional knowledge about astronomy today with hopes of preservation and education. The Passi family approved the name.